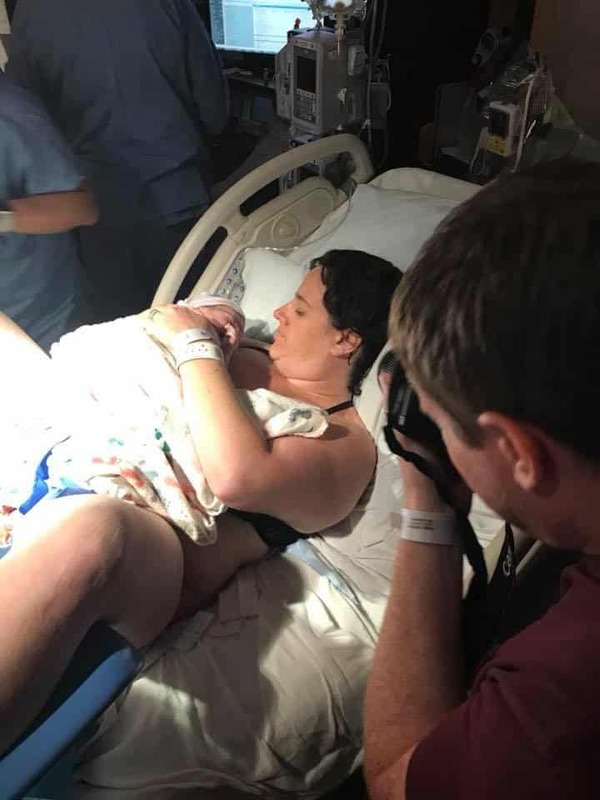 To achieve our goal of an unmedicated VBAC, I used a doula, Hypnobabies, and found new provider because I didn’t feel the doctor that performed my cesarean section with our first would be supportive enough for a VBAC. I will be using Hypnobabies terminology. 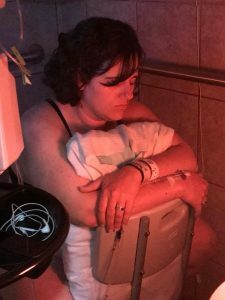 With a history of Gestational Diabetes and our first son (now 5) being a rather large baby, I started my pursuit of a supportive provider, doula and medication-free comfort management before we started planning to become pregnant. I wound up settling in Mid-City Midwives & OBGYN (my care started with the midwives, but did transition to Dr. Jaime Seeman due to medication needs I had), Andrea Showers as my doula from Omaha Birth & Babies, and Hypnobabies home study after a friend recommended it to me. Dr. Seeman was extremely supportive of my desires for a VBAC, and I feel she really individualized both my and our baby’s care throughout my pregnancy. She made suggestions based on baby’s estimated size (we had very consistent ultrasounds to be as accurate as possible), the status of my body and medications. Together, we decided that being induced just before my 40 week guess date would likely give me the best shot to have a successful VBAC. 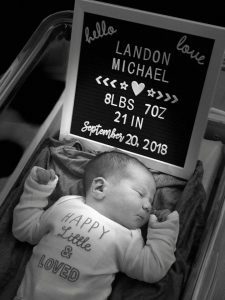 We went to the hospital on Sept 19 for a slow induction. The plan was to start with a Foley bulb and low doses of Pitocin overnight. At my arrival, I was about 1-1.5 cm open, but still pretty thick and baby was still pretty high. The Foley bulb was inserted at 8:30 pm. Around 8:45 pm, I was wanting to do some walking, but when I stood up, my water broke! I was nervous because I had hoped I’d still have plenty of time for the Pitocin dose to slowly be upped until I was in my active birthing time, but I used my Bubble of Peace (Hypnobabies reference) to help me stay calm. I listened to my birthing day tracks and walked on and off throughout the night since I was having difficulty sleeping anyway. We called my doula to alert her that my water broke earlier than anticipated, but that we were still doing well. Around midnight, I had been resting in bed for a bit, and decided to shift positions. When I did, the Foley bulb fell out, meaning I had made it to 4-5 cm. My doula arrived around 7:30 am on Thursday. When they checked me that morning, I was at 5 cm, but baby was still high. The nurses talked with Dr. Seeman, who thought we should keep slowly increasing the Pitocin until I was in transformation. By around 10 am, I was much less comfortable than I had been. Our hospital has rooms with tubs and some without. Unfortunately, there were no rooms with tubs available, so we tried having me sit/stand in the shower with warm water running over me. Every time I got in the shower, I made progress, much more quickly than when I was anywhere else. During my time in the shower, we listened to the Easy First Stage Hypnobabies track. The nurse checked me a few times during the process, but never told me where I was. She would relay the information to my doula and husband. I would hum through the intense waves, and my doula applied warm, firm pressure to my lower back as needed. My husband would remind me of the Peace and Relax cues to help me stay calm. My doula also brought an essential oil diffuser with a soft orange glow (for hypno-anesthesia) and kept the lights in the shower off other than the diffuser light. I was able to sway, move the water where it felt the best, squat, lean against the support bars, sit, etc. Just when I felt like giving up because I had felt like I had been in transformation from the 5-8 cm for a very long time (in reality it was only about 2 hours), I asked to consider Fentanyl for the pressure in my back. The nurse checked me and told my doula that I was at 8 cm open, baby was at zero and I was almost completely effaced. When the nurse updated Dr. Seeman, Dr. Seeman told them to turn my Pitocin off and let my body finish to completion on its own. Based on this, she said I couldn’t do Fentanyl, and my only option was an epidural. Although I was tempted, my doula reminded me that I had strongly believed the epidural was a major part of the reason my first birth ended in a cesarean, and that it didn’t help with my back discomfort much anyway. She also pointed out that by the time they pushed the bag of fluids and got the epidural started, I’d be ready to begin pushing. With her reminders, her belief in me and my husband’s reassurance, I decided to keep at it with no medications. It was further reassured when Dr. Seeman arrived and told me she wasn’t leaving until our baby arrived because I was getting close to the end. It was amazing how much easier it was to work through the waves with them being my natural waves instead of Pitocin waves. I remained in the shower for a little bit, and Dr. Seeman checked me and told me I was complete (I think at 1:55 pm), but to keep doing what I was doing until I felt the need to push. She would periodically remind me to try and squat through a wave to really help bring the baby the rest of the way down. Around 3 pm, I started feeling the urge to push but was getting tired from standing, squatting and swaying so much through my birthing time. Dr. Seeman suggested I move to the bed and use the squat bar, so we did. That really helped me start moving the baby down. After about 10 minutes of mother directed pushing, the baby’s heart rate was dropping during waves and when I was pushing, so Dr. Seeman had me try to breathe through a couple of waves with some inhaled oxygen. Unfortunately, the baby’s heart rate continued to drop, so she did need to use the vacuum to assist right as he was coming out of my body. After a couple of intense pushes and vacuum, our baby was born and placed in my chest. It’s a boy! The nurses checked him over quickly to make sure he was healthy and then brought him back to me. I was able to do skin to skin while Dr. Seeman repaired a small tear and while I waited to birth the placenta. I did a lot of listening out loud to Easy First Stage while in the shower, TONS of Peace and Relax cues. When the waves were more mild but ramping up, I’d gently breathe out and audibly say “Peace”. When they were more intense during transformation, I’d hum through the waves while my husband and doula would tell me to Relax my eyebrows, or shoulders, or whatever appeared tense. They’d both remind me to use lower vocal tones if I had started using higher pitched sounds. Having the literal orange glow in the dim lighting was also hugely helpful for me to remember to use and move my hypno-anesthesia. Although I didn’t perceive this in the tracks while preparing, I wound up also visualizing the water from the shower as my hypno-anesthesia as well. I was astounded at how well Hypnobabies prepared me for my birthing time during this VBAC. I was so proud to have a healthy, 8lb 7oz baby boy in my arms with a successful, unmedicated VBAC. We were discharged after less than 48 hours in the hospital!